Starts like the Polka Mazurka, but adds a second lift (in front) before turning half round with a slide-hop. 2: The Lead closes his right foot to his left foot while the Follow closes her left foot to her right foot. 3: The Lead draws his left foot up behind his right heel, taking a small hop on his right foot. The Follow draws her right foot up behind her left heel, taking a small hop on her right. 4: Taking another small hop on the his right foot, the Lead brings his left foot up in front of his right ankle, while the Follow takes a small hop and brings her right foot up in front of her left ankle. 5: The Lead slides his left foot around in front of the Follow, as she slides her right foot forward between his feet, beginning to turn halfway. 6: The Lead hops on his left, bringing his right foot in front of his left ankle, and the Follow hops on her right, bringing her left foot in front of her right ankle, completing the half turn. 7-8-9-10-11-12: Repeat it all with the opposite foot, dancing it over the elbows. Easily verbalized and remembered as "slide-close-lift, lift-slide-hop." 1. Slide left foot forward. 2. Spring on right foot. 3. Hop once on right foot. 4. Spring from right to left foot. 5 and 6. Hop twice on left foot. Then as before, only commencing with right foot. Though the intended placement of the feet isn't clear from this abbreviated description, I interpret it as similar to a combination of the first half of the Polka Mazurka with the first fourth of La Carlowitzka, i.e., "slide-cut-lift, leap-hop-hop," turning halfway round on the "leap-hop-hop." Though the later version was obviously more popular, I actually like this earlier version better - it feels less fussy and much easier to lead and follow. None of the sources below reference a reverse turn, but there's no reason you couldn't dance it turning to the left - not that it needs to be made any harder than it already is! The Library of Congress reconstruction also includes a crossed-hand promenade version, not described in any of the sources, but well-within the realm of 19th century possibilities. 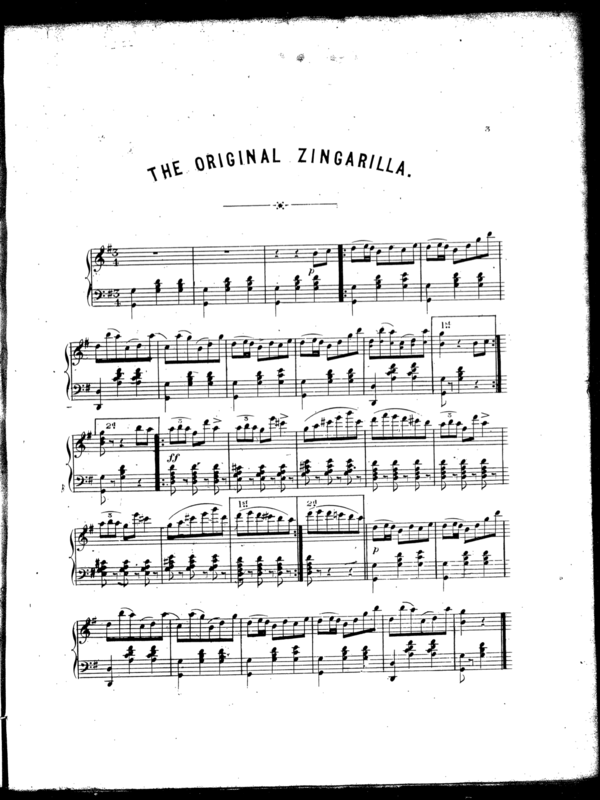 There are also several late-19th century scores that bear the name "La Zingerilla," but they are in 2/4 time, unrelated to this dance. 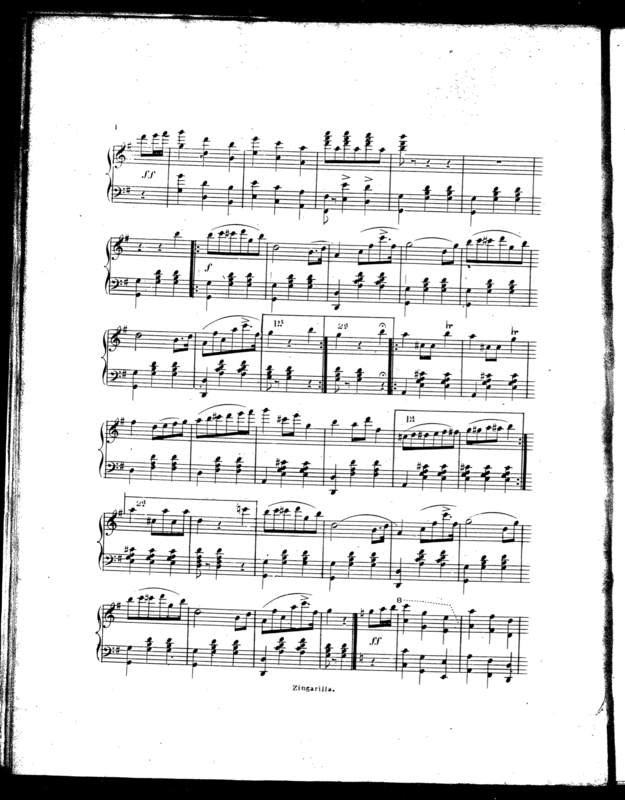 The original version was presented as a "new dance" in St. Ody 1854. The later, more popular version appears a few years later in Ferrero 1859. It was last seen in Gilbert 1890. Gentleman takes partner as in waltzing. There are six motions or times in each bar, making a half revolution, as in the waltz. 1. Slide right foot forward. 2. Spring on left foot. 3. Hop once on left foot. 4. Spring from left to right foot. 5 and 6. Hop twice on right foot. Then same as before, only commencing with left foot. Slide the left foot forward (count one). Bring up the right close behind the left (count two). Spring on the right; at the same time bring the left behind (count three). Spring again on the right, and bring the left in front (count four). Slide the left forward again (count five). Spring on the left, and bring the right in front (count six). The same with the right foot, changing the feet alternately to recommence. 1st. The gentleman will slide the left foot forward (sideway—count one). 2d. Bring up the right foot close behind the left, in third position (count two). 3d. Spring on the right foot, and at the same time pass the left foot behind the right without touching the floor (count three). 4th. Spring again on the right foot, and bring the left foot in front, to third position (count four). 5th. Slide the left foot forward again (count five). 6th. Spring on the left foot, turning half round and bring the right foot in front, to third position (count six). Then recommence with the right foot and repeat the same, first commencing with the left foot and then with the right, alternately. For the lady the directions are the same, only reversing the feet. Slide left foot to side (2d), 1; close right to left (3d behind), 2; hop on right and bring left behind (3d behind raised), 3; hop on right and bring left in front (3d raised), 4; slide left to side 5; hop on left and bring right in front (3d raised), 6; two measures. Repeat, commencing with right foot. Recommence as at first. The turn to be made while hopping.